yeah i am at the moment, and will be, due to the fact i do just under 3k a month, and its stupid me and my dad taking 2 cars to the same place every day isnt it?, my 3 is now 3 months old and has about 7k on the clock! as i said in another thread welly, dont judge untill you have the full story! due to the fact i do just under 3k a month, and its stupid me and my dad taking 2 cars to the same place every day isnt it?, my 3 is now 3 months old and has about 7k on the clock! Astonishing that you can claim to wrack up 3,000 miles a month, when you get a lift to work every day! You must drive your car up and down the length of the UK at night and the weekends based on those figures! Thats funny too, it only had a couple of thousand a few weeks ago!!!! ive got a lift for the past week or so now, bacuase of the main reason it costs to much. sorry if my financial situation wich leads to me getting a lift to work offends you! No wonder you are skint putting all that petrol in your car, or does it run on hot air? erm basically i was just woundering if any one know's weather or not team dynamics make the pro race 1.2's in silver and in 17" for the mazda 3, ive surched on the net but have had no luck. welly you know what, im sure you dont belive me i have a mazda 3, and to be honest your more that free not to, but one day when were both at a mazda 3 meet, and i get to show you ex59 fsa! im sure i will be the one will all the stuff to say i.e. haha! see jumping to conclutions gets you no were!, and well as u said in another poast, your 16! ive met neil, the runner of the oc, at my work, and he has seen me drive the mps, if i was only 16 and didnt have a licence do you really think i would be allowed by my boss to drive a 21.5k car. no didnt think so.! So are you saying you didnt have that conversation on Bebo then? Or did you just get your dates mixed up? I have never said you didn't own the car you say you do, your putting words in my mouth. What I AM saying is that you contradict yourself a lot and in some cases one or the other post is an untruth. no welly your just said in another topic i was discussing my 16th b'day 22 weeks ago, and if i was doing that then how now would i been allowed to drive cars at work or on the road, i wouldnt, becuase a. i wouldnt be able to, and b. i wouldnt be insured to. so it would just so what you are saying is ive lied about my age on here wich i havent, you also tried to catch me out on getting a lift to work with my dad, and as i said its becuase i can no longer afford to run my one to that extent, after going on holiday im liturally skint so i have no option, and yes when i 1st got my 3 i was consideering a 106/206 simpley becusause i was dissapoioneed with the engine not the car, but now its loose its fine!, but mate no offence its obvious u dont like me due to the fact that you have gone to such extrams to prove me wrong on several ocations!, and thats fine just keep it to your self, to be fair mate you have caused this whole thing for no reason!, and i ask you what was the point, you could have simply sent me a pm expalining your self and that would have been the end of it, but no. you did it the hard way! and yeah i got paid, and then i found out how much money i owed, so i wont be getting the alloys as much as i would like them, but hey S**t happens! 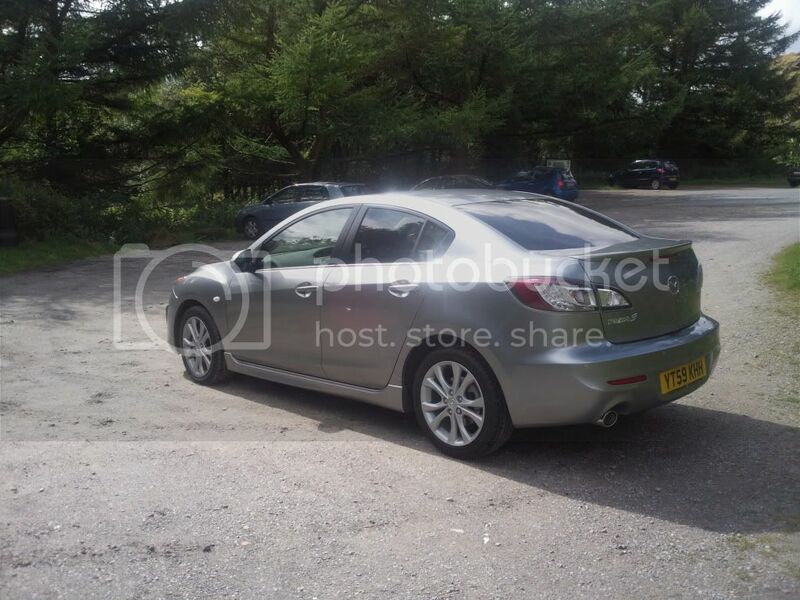 haha duc de pommfrit, am i right in thinking you have the face lift mazda 3 sport alloys on your car, looks nice, i think i prefer them to the ones that came on that year modle! Cheers, they do look better. £50 off ebay. But then spent £400 on tyres! i know tyres are a killer, i had a customer the other day on a mazda 6 ts2 "17inch alloys as standard" and he wanted the sports 18" alloys the alloys came out to 120 each and he said yes then our parts man said pluss £350 on tyres and then he was like ermmm no. its unreal how much they cost! im going to get a new set of 17" alloys of the same with as mine 205 as soon as i can afford them so that i can use the tyres i have on the standard alloys. It wasn't me that mentioned your lift too work!!! And what I said was, you were having a conversation on Bebo (which you have now cleared up) I didnt accuse you of lying about your age did I? I just stated that you had had the conversation on Bebo. ok sorry welly! that post was befor our convo in the other one! my bad!